Let us tell you a little bit about Leech Lake, it’s what’s right outside your lake home cabin door when you stay at Adventure North Resort. Leech Lake is one of the largest lakes in Minnesota. It’s irregular shape with many large and small bays makes for lots of “secret” fishing spots. Leech Lake is well known among Minnesota anglers for its walleye, northern pike, jumbo perch and muskellunge fishing. Leech Lake also provides quality angling opportunities for largemouth bass, black crappie, and sunfish in several shallow vegetated bays. Leech Lake is the third largest lake entirely within the boundaries of Minnesota and has approximately 112,000 surface acres. The deepest area of Leech Lake, MN is located in Walker Bay where depths reach around 150 feet deep. Approximately 80% Leech lake is less than 35 feet deep. 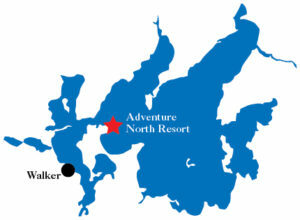 Adventure North Resort is located 15 miles from Walker, MN by car and about 20 minutes by boat. The resort is located is marked with the red star on the Leech Lake map, located on the tip of Pine Point, making our location ideal for getting around the large lake fast and with out burning a lot of fuel. To provide a great fishing experience while protecting the mature female walleye population the MN DNR has issued a regulation that all Leech Lake walleye between 20.0-26.0 inches long must be immediately returned to the water, a possession limit of 4 walleye with one longer than 26.0″ allowed in possession. Adventure North Resort works locally with the MN DNR to help preserve our lakes. Below is a message from our local large lake specialist at the time, Matt. I will start out 2016 with some good news. We sample zooplankton monthly on Leech at five locations from mid-May through mid-October (N=30). Although we target zooplankton, this sampling regime provides the opportunity to look for zebra mussel veligers and spiny water fleas. None were present in any of the 2015 samples. Please continue in your efforts to keep these invasive species out of the lake. Please purchase your Minnesota fishing license before arriving at the resort. All guests over age 15 will require fishing license and a Social Security Number will be needed to purchase. Kids 15 and under can fish without a license if there is an adult with a license present. Before going to a body of water, boaters should complete one of the following recommended actions. 1. Dry the boat and all water related equipment for a minimum of 5 days , or 2. Wash/power spray the boat (preferably with hot water) to remove and kill all plants and organisms in an area that will not run into the lake. Boaters are required to complete three main actions before leaving the access. 1. Clean the boat by removing all plants, mud, debris and organisms from the exterior and interior of the boat (including angling equipment and the anchor). 2. Drain all water from the boat and other water related equipment, including bait water. 3. Pull the plug (it must remain out during transport).